As a member of the HIFLD Executive Secretariat, NAPSG Foundation encourages our member network to participate in the Annual HIFLD Community Feedback Session. The session will be held on Monday, December 11th, 2017. It allows stakeholders to share experiences, lessons learned, and emerging best practices around data preparedness, national data assets available through HIFLD Open and HIFLD Secure, and to raise & discuss critical questions and issues that will inform future development and investment in infrastructure data. The Department of Homeland Security Science and Technology Directorate (S&T) recently had the chance to address national public safety and homeland security leaders, first responders, and geographic information system (GIS) professionals on the issue of flood resiliency. The third annual National Geospatial Preparedness Summit (NGPS), held at the University of Alabama in Tuscaloosa, provided capacity building training for the public safety community. S&T First Responders Group (FRG) provided expertise to support the development of this year’s training program, sessions, workshops, and the functional preparedness exercise based on a real-world flood scenario. The functional exercise was the pinnacle event, allowing the more than 200 participants, representing 39 states and 120 agencies, to put into practice the new skills and knowledge they gained during the first two days of the event. The exercise simulated the 2015 Memorial Day flooding event in Texas. Participants walked through the event, starting with a preparedness phase and then moving into the actual response period. The operators and decision makers worked with technical and GIS staff to communicate their needs and requirements, and to see what data, technology and analytics could be provided to help their decision making process. Participating in the NGPS expanded S&T’s reach to constituents, providing a unique venue to gather information from public safety and homeland security leaders from across the nation, and allowing for a better understanding of S&T’s work on emerging or recently transitioned technologies,. As part of FRG Director Dan Cotter’s remarks, he introduced S&T’s recently released Project Responder 5 Report (PR5). Prepared based on the feedback from First Responder Resource Group members, the PR5 reexamines and updates emergency response capability needs in light of current operational demands, new and emergent threats and hazards, new environmental conditions, and recent technology advancements. FRG also highlighted the National Information Exchange Model, Emergency Data Exchange Language, Capability Maturity Model, and Internet of Things technologies. “The NGPS provided S&T a significant opportunity to engage stakeholders from across the first responder and technology community to share new and emerging research and development from DHS S&T, introduce participants to new technologies available to support their operational needs and discussion technology gaps, and obtain feedback from the community on our R&D activities,” said David Alexander, FRG’s director of the Flood Apex program. “S&T’s presentation during the summit was spot on. It was kind of a perfect synchronicity in terms of validation. We are all hearing similar things from different people around the country. It is important that we are tuning in and listening to what the public safety community is asking for collectively,” Harned said. The S&T Flood Apex program team will use information gathered from the event and feedback from conversations with the participants to inform S&T’s research agenda and refine some of the current R&D projects. S&T will be supporting a three-day flood analytics symposium November-7-9, hosted by the University of North Carolina Coastal Resilience Center of Excellence and Renaissance Computing Institute in Chapel Hill, North Carolina. This symposium will bring together leaders from many disciplines to explore innovative and disruptive approaches to flood prediction and impact analytics. 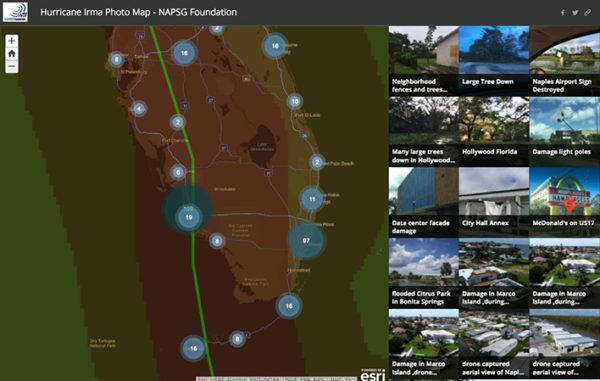 We are excited to share that the NAPSG Foundation Hurricane Irma Crowdsourcing Photo App is the Esri ‘Story Map of the Month’. The photo app below was created in partnership with the GISCorps.